One of the largest hurricanes to make landfall in the U.S. Gulf Coast region since Hurricane Camille in 1969, Hurricane Katrina left a trail of devastation behind it as it touched down in Louisiana, Mississippi and Alabama yesterday. On its destructive path, it affected not only the Gulf communities and shorelines it passed, but also the oil and gas market. After the storm deluged Florida over the weekend, it intensified from a Category 2 storm to a Category 5 in the Gulf, according to the NOAA Hurricane Warning Center. Thousands of people were evacuated from New Orleans, which lies below sea level. The city was inundated by high waters and winds, though so far not as severely as expected: The hurricane diminished in intensity to Category 4 as the eye moved farther east than originally predicted. 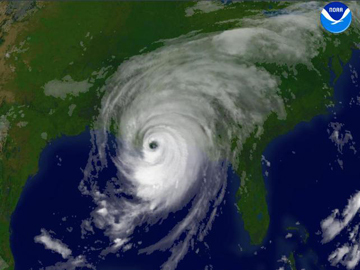 This satellite image shows Hurricane Katrina on Aug. 29, as it came ashore in Louisiana. At this point, the storm's intensity was rated Category 4. Image is courtesy of NOAA. Homes on the eastern side of New Orleans lay underwater Monday evening, and as many as 10,000 people took shelter in the city's Superdome, which lost chunks of its roof but never flooded, according to the New York Times. Mississippi suffered as many as 80 deaths in one county alone, the state's governor reported. The extent of the damage still remains to be assessed. Meanwhile, industry and government are mobilizing planes and people to assess other impacts. The Gulf region provides about one-quarter of the nation's oil and gas needs. The extent of the damage to pipelines and drilling rigs remains to be completely cataloged, according to Gary Strausberg, spokesman for the Minerals Management Service in Washington, D.C., and major oil companies announced they would send out planes today for aerial surveys. Oil drilling platforms adrift in the Gulf have been reported only unofficially so far (one Getty image, included in a New York Times photo essay, showed a rig that broke free from a shipyard and drifted into a suspension bridge in Mobile, Ala., during the storm). Gas prices started rising Sunday, in anticipation of Katrina, after oil companies took protective measures and shut down their facilities. Two nuclear power plants also geared down, according to the New York Times. At this point in the annual cycle, energy companies were starting to shift away from gasoline production as summer demand decreases, and prepare for the imminent increase in demand for winter heating oil, says Michelle Michot Foss of the Bureau of Economic Geology's Center for Energy Economics, based at the University of Texas, Austin. Natural gas pipelines are of concern, she says, for natural gas transport and storage. "Injections for natural gas were going pretty well," Foss says, but "if we fall behind, prices will show that [disruption from the hurricane] immediately." As for gasoline, the final arbiter of its availability and pricing may be refinery capacity, and not the availability of crude oil, which is relatively high at the moment despite the temporary facility shutdowns in the Gulf. Chevron warned its distributors that temporary rationing might be necessary, according to a press release on the company's Web site, and the company's Pascagoula, Miss., refinery remains shut down for now. So far, Foss says that she has seen a 20-cent jump for a gallon of gas at her local gas station, and some observers speculated that prices could reach an average of as much as $3 a gallon, in a short-term spike, possibly this week. Despite the destruction wrought, "storms such as Katrina actually have a benefit, both to the beaches and to the marshes," says Robert A. Morton of the U.S. Geological Survey Center for Coastal and Watershed Studies, in St. Petersburg, Fla. Beaches can receive an infusion of sand, which helps "certain birds, such as the piping plover, which is on the endangered species list, that require that kind of environment," he says. Large storms also provide marshes with "a supply of fine-grained material that gets back into the grasses and helps them sustain a permanent level above the flooding level." Marshes around New Orleans have no other supply of sediment, as they are cut off from the Mississippi River by levees and other management efforts that have curtailed flooding that once brought suspended sediment. Still, Morton says, the overall battle to keep up with rapid subsidence in the region can't be won with such small infusions from such large storms (see Geotimes, August 2005). Although Hurricane Katrina is one of the largest storms on the record, it is not out of the ordinary. Such extreme events are part of a multi-decadal cycle (see Geotimes Web Extra, Aug. 8, 2005); the last surge in such storms occurred in the 1950s and 1960s. Climate change most likely has little to do with such shifts in hurricane patterns.